Here's a link to a fun article about a brewery in Bruges building a pipeline to the bottling plant to keep hundreds of beer tanker trucks off the roads. Now this is a pretty good time, energy saving idea, but it could have been a great idea. Why not just cut out the middle step, the bottling, and pipe the fresh beer right into your abode? Yes, yes, right there with the running water, hot and cold, and fresh draft beer. Just a bit more creativity was all that was needed. But, good job otherwise guys. There are things you'd like to count on, and gravity is one of them, yes, even when you're at the top of a ladder. Here's the thing. Ice has mass; it's heavy because it's water, which is pretty heavy, just ice is just a tad less dense than water, which is one of the few substances whose solid form is less dense than it's liquid phase. Now what is happening is that a lot of ice is melting in Antarctica, so much that the loss of this mass is ever so slightly altering gravity; it's a tiny bit less down there now. When you start messing with gravity, people should start paying attention. Just think how much ice has to melt to affect gravity! It's that darned old global warming to blame. Oh yes, and the water that was ice, what about that? Well, goodbye Florida, goodbye Louisiana. Will their governors go down with their states denying all the way? Sure. This time of year is tricky for gardening especially when mild warm weather predominates, but things aren't growing so much. Gardens just don't look like it's the end of September out there, and it's easy to get lulled into complacency. So here's the thing: keep those newly planted trees and shrubs, especially conifers, well watered. Remember winter survival is more about desiccation than it is about cold. Deciduous plants drop all those water-wasting leaves, but most conifers are evergreen, and while their leaves have relatively small areas and correspondingly less water loss, as the air gets colder it gets drier and when the soil freezes water is really "hard" to take up. So it's easy to lose track of rainfall and let plants dry out too much before the cold really sets in. TPP is now certain that his prize conifer died during the winter not because of cold but because of the severe drought the summer before. And that combined with less well established roots was a deadly combination. Remember, half an inch of water a week is needed at a minimum to keep things growing well, and water those newly planted trees and shrubs deeply. If you need any evidence about why the USA needs more stream-lined, efficient health care plans, today's mail brought a datum, actually data. Yes, the Phactors needed a new post-65, post-retirement (for TPP) health care plan, and this required a considerable amount of paper work. Today's mail delivery consisted of two huge packages, one for each Phactor, a couple of booklets, or rather health care catalogs that would have made Sears & Roebuck proud, a total of almost 10 lbs of paper! What a tremendous waste! No one noticed that two identical documents were destined for the same address, for two people with the same last name. Probably verification of marriage was not provided. Also, one of us had already gotten these same documents. This waste costs money and is it counterproductive too? Yes, the poor mail carrier got a hernia hefting our health care plans! Poor guy. He'll need a good health care plan. With all of this secessionist politics in the news, you might want a t-shirt like this to voice a more united position. A number of years ago the paleobotanists had a button that said "give Pangaea a break", and this is the same joke just from a different perspective. Of course it would be more appealing if they had spelled Pangaea correctly. After all you wear such a shirt to look a bit clever, but in this case, not. One obvious aspect of field research is that you cannot apply treatments or gather data if you cannot find your permanent plots. Now least you think TPP is careless or an amateur, several precautions were taken this spring, and in prior springs, to mark and map the 100 or so meter square plots out there on our research prairie. There is a permanent spike in the SE corner and smaller markers in the other corners, and in the late spring a 30" piece of white pvc pipe is pushed in over the spike. Then in early summer 4-6' bamboo poles are placed within the pvc pipe with a bit of gaudy flagging on the top in those areas where the prairie vegetation is known to grow the tallest. TPP's September assessment is that tall grass prairie had a very good year; the vegetation is thick and tall, and even the bamboo poles are all but invisible. The tallest vegetation reaches 8-9 feet tall and it's solid up to 5-6 feet tall, so dense that TPP had difficulty even pushing through it. Armed with maps and familiarity and experience, it only took us 5 hours to find most of the plots and remark them so samples could be easily collected next week. It was exhausting work and at times my colleague was totally out of sight even though only a handful of meters away. These plants are all herbaceous perennials so all of that above ground biomass grows annually, and in this case on some very poor, low nutrient soil. Still you would have to experience such vegetation to truly appreciate just how amazing the prairie is this time of year. And in case you wonder, very few short students have been lost in the course of our research. TPP is late to this issue; so what? In one sense Urban Outfitters marketing a bloodied Kent State University sweatshirt almost deserved no comment, so utterly tasteless is this idea. Who in bloody hell would order one? If you actually remember the event at Kent State that spurred this product then you are over 60, and if you think such a shirt if clever, then you never gunna grow up. It does occur to TPP that all discussion about militarization of the police, Kent State is what happens when you let the military take care of something that should have been a police problem. Innocent people get shot. This was the event that produced the anti-war national student strikes across the country that disrupted TPP's senior year. Nothing like having to cross picket lines to take organic evolution to make you think about what was important. People too young for the Vietnam War era wouldn't get the "message" Urban Outfitters was selling, so what demographic were they aiming (sorry) at? The whole thing boggles the mind. In protest the administration building was occupied immediately; ended up playing cards with the undergraduate dean, which seemed pretty non-violent. So this still just leaves one big question: what kind of person of what age actually thought this was a pretty good idea? TPP's boycott of Urban Outfitters will continue, as will his boycott of HoJo's. So don't risk his fiscal wrath. Somehow over the past several decades the Phactors have accumulated 300 or so green wine bottles of the standard type with shoulders. All of them have been cleaned of labels and there are a variety of green hues from dark green to pale green. Now having expended this much energy just recycling these bottles into more glass seems a waste. What the Phactors want is a thing of beauty and a joy forever, something fanciful and perhaps aesthetically pleasing, perhaps whimsical, perhaps something funky to grace some spot in their gardens. But what? So this is the reader challenge. What can be done with these wine bottles to enhance our gardens? Your ideas are welcomed. Point us to somebody else's great idea. This doesn't have to be a do-it-yourself type of project. Just as we were to pose this question to a local glass artist, a young ambitious fellow, the old warehouse that housed his studio and ovens collapsed and rather abruptly brought an end to his glass workshop, a bloody shame. So let your imaginations run wild. Here the USA goes again. You think this country would learn, but noooo-oooh. Once again Tom Tomorrow nails it. What can possibly go wrong? Ah, the smell of freshly mowed creeping Charlie in the morning; nothing quite like it. Although the Phactors have extensive gardens, so big is our city estate that enough lawn remains to more than equal the amount of lawn on 3 or 4 or 5 standard-sized city lots which around here are 50 x 150. Now this would be an onerous task except that much of our lawn is in light to heavy shade so it doesn't require mowing very often. In these circumstances nothing beats creeping Charlie or blue violets, except maybe a shade-loving sedge. Lawn purists will wrinkle their noses and not a month goes by but when some chemical lawn care company leaves its toxic brochures tucked in our front door. Creeping Charlie and blue violets only grow so tall, and today's mowing was the first mowing of the shadiest area in 2 months. Apply chemical lawn killers to this area and nothing would be left but bare ground, and while this might be turned into forest understory, it really only looks good in the spring. This is because some of our other lawn "weeds" (trillium, wild ginger, blue bells, Solomon's seal) are not apparent because they are spring ephemerals. So tip number one is do not mow too often certainly no more than once a month. Tip number two is do not obsess about grass even if it is a minor component of lawn. Tip number three: buy a lawn mower capable to dealing with bits of bark, twigs as big as your fingers, and a smattering of leaves. This is part of having an ecological lawn. You know you're dealing with an obsessive when they speak of mowing the "grass" as if in some suburban universe a monoculture of grass is a desirable thing. As this blog is being written a neat, undulating sward of green spreads before the perennial gardens beyond. At this distance no one can identify the plants composing the green: neat, green, aesthetically pleasing, so what more is needed? Ah, just one thing, affirmation from an expert! And now you have it! Everyone has seen the slip on a banana peel gag in cartoons or old slap stick movies, but what kind of an inquisitive mind decides to actually measure just how slippery a banana peel is? Well, here's a report on this award-winning research. And the award? Why the Ignoble, of course! Highly coveted you may be assured. No, no, no, no, no - Goldenrod doesn't cause hayfever! The fall allergy season is here, almost. The harvest season kicks up lots of dust and mold spores, and ragweed comes into flower soon. The local newspaper had a nice sidebar article about allergies and they mentioned all of these factors, BUT then some moron put a picture of goldenrod in bloom above the article! Now maybe they think goldenrod is ragweed, or that goldenrod causes allergies; wrong and wrong. Here's the problem: they both flower at about the same time, and most people see and recognize goldenrod, but they don't see or recognize ragweed. This is because goldenrod is insect pollinated; you should know this because the flowers are showy to attract pollinators. Ragweed flowers are green and seldom noticed as a result, but the plant is wind-pollinated so it must make a lot of pollen to blow around. Once again, TPP only wishes they would check with their friendly neighborhood botanist before doing such things; he doesn't charge much. Late summer flowering in Mrs. Phactor's perennial garden runs largely to the color pink but in a wide variety of plants. Here and there a little white and pale blue sneaks in. In the ongoing quest for more diversity, an aster was purchased at a native plant sale and then another aster purchased at a perennial sale elsewhere and both were planted to help fill in an area largely denuded by herbivores of one sort or another. And now several months later both asters are flowering, and both have pale blue-lavender ray flowers and yellow disk flowers (Does anyone need a refresher lesson on the inflorescences of composites? Remember, those ray flowers are not petals.). Exactly what is what is a fairly reasonable request, and one species was written down in a notebook, maybe, if that's what it refers to, and the other one was not, but which is the "other" one? Well, you don't teach plant ID for over 40 years and not be able to deal with this. Ah, yes, a quick garden check on the plants in question, asters indeed, and to make matters short, sweet, and easy, name tags had been placed appropriately at their bases when these were planted. Yea! The larger species was Aster laevis, the smooth blue aster, the Illinois native, standing about 4' tall with flowering heads (remember they aren't flowers) little over 1" in diameter (top - 2 heads). The smaller species was Aster azureus, the sky blue aster, standing about 2.5' tall with flowering heads about a half inch in diameter. Not sure if smooth refers to blue or something else, and both look pretty lavender. Both are quite delicately handsome, but TPP predicts having trouble remembering which is which in the future, which is why they were planted almost next to each other to aid the memory. To aid our recall, some notes were added to the master list of garden plants. There are certain things in life that you continue to seek, for example, an excellent wine under $10 a bottle and great bargain plants. This is the time of year when big box stores heavily discount their plants to empty out their garden centers. Mostly the plants are not worth the effort, however, it doesn't cost anything but a little time to take a quick look. TPP was pleasantly surprised to see a number of small shrubby magnolias that were in particularly good shape for late summer. TPP's second caveat is that most of the plants in late season sales are not of much interest to the more sophisticated gardener, but TPP had to change his mind after seeking red currants and only finding them, and excellent plants too, at a big box store. To TPP's great surprise, one of the magnolias was M. kobus var. loebneri (M. x loebneri), which sort of looks like a star magnolia in growth habit, but it flowers a bit later and the flowers are light pink. Wow! The next worry is that potted trees and shrubs can be rather root bound especially late in the season. TPP recommends giving the pot a tap and pulling up the root ball for a look. In this case the root ball was in great shape so it will only take a few minutes to spread the roots out nicely which is necessary because this greatly improves the early growth ultimately the survival of the plant. And here's the best news of all; it only cost $20! Oh, yes, a new magnolia that's already 4' tall and ready to flower in the spring, and only $20. Now where to plant it? 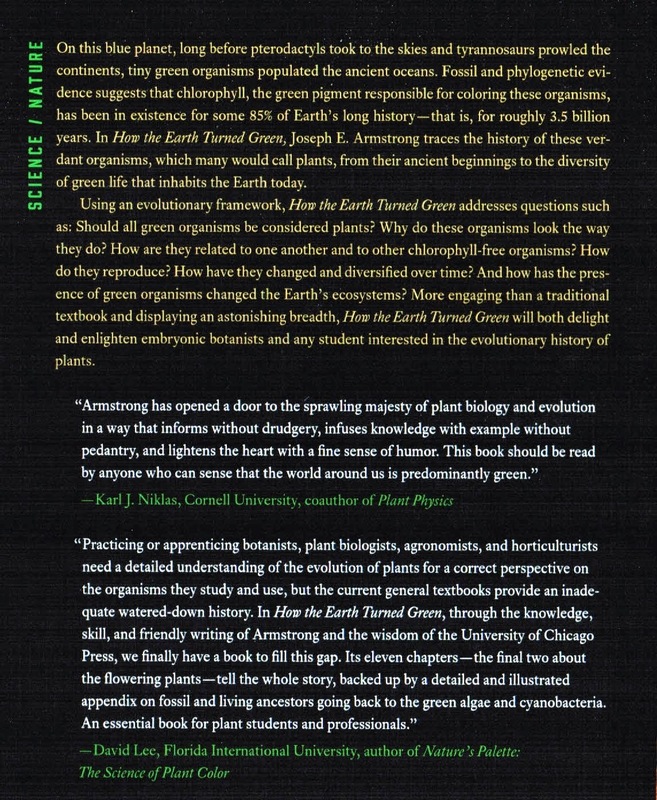 Here's the front and back covers of a brand, spanking new book about plant diversity. Armstrong writes OK and he knows his stuff pretty well, in my opinion. Most importantly this book wasn't written for botanists, it was written for everyone else who might be interested in learning more about the history of plants, about plant diversity, a subject that isn't known well outside of botanical circles. Plant diversity usually is presented in textbooks as a group by group plant menagerie focusing on reproductive cycles and the associated jargon. 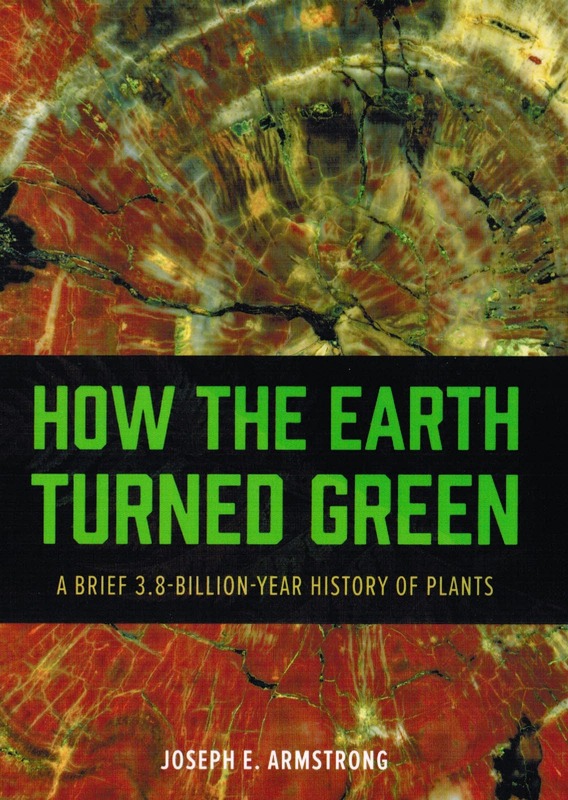 Most importantly How the Earth Turned Green (Chicago University Press) wasn't written like a textbook so plant diversity could be presented in an interesting manner. TPP gives this book his endorsement, and he didn't even get a free copy for saying so. Just a couple of days ago, TPP explained that he was a botanist. This was because the Botanical Society of America started a campaign for its members to loudly (?) proclaim themselves botanists. If you want to see some of the hundreds of responses from social media adept people who are botanists, click on over and have a look. These are TPP's colleagues and he's proud of them! Here's a nice article at the Philadelphia Enquirer explaining what some of my colleagues are doing to combat "plant blindness" and zoochauvinism. Can any university claim to be a distinguished, quality institution of higher learning if they do not have decent ice cream in their student center/union? Clearly an absurd question to which the answer is equally clear; no. A few universities of the ag/tech sort have dairy science departments where students in ice cream (DS 101) plus advanced studies where less common flavors as well as frozen chunks are explored, sell the products of this academic endeavor with excellent results. OK they may not have 29 flavors, but often the ice cream is of top quality. But even here apparently there are no advance courses in gelato, and one wonders why? Maybe the romance language programs have fallen on hard times, especially with the aggie crowd, but this is hardly an excuse to ignore their culture's best products. Come on people, frozen yogurt vs. gelato; it isn't even a contest. Our university is one that cares so little for the academic enterprise, its reputation, and sugar-induced creativity that there isn't even soft serve [ice cream] frozen custard, maybe a brand like IQ. A frozen yogurt place tried to make a go of it, and it failed for lack of business, based upon TPP's analysis, the result of a combination of high price and low quality ("it tastes ALMOST like ice cream" (my emphasis)]. So this is now the mantra for the anti-ice cream crowd, ice cream is not fiscally viable, but fiscal sacrifices are considered OK if they benefit sports, but student union space is sooo valuable, they've priced ice cream out of this market. The snack shop does have Blue Bunny ice cream bars, but they are hardly the thing to capture your imagination or interest; no theses from these for certain. So far the higher administration and the trustees seem to lack interest in this issue, which makes you wonder about their priorities. Now when polled independently, the students seem quite uniformly in favor of ice cream on campus and not just in some stupid "ice cream zone". Of course at a few very elite schools you can get espresso milkshakes made with real coffee thus taking care of two metabolic needs in one delicious dose. Perhaps if it were presented as a state educational mandate, ice cream would be forthcoming on campus, but only after an assistant provost and a committee of faculty studied the issue for a year and issued a working paper on ice cream policy to be discussed at open forums. Cups vs. cones, how many flavors, Sunday or sundae, plastic vs. real spoons, and so on. It's the way things are done. Those who fail to learn from history are doomed to repeat the past. TPP was a young adult of military draft age during the Vietnam Conflict (only Congress can declare war, and no war was declared), and it was obvious from the start that the military might of the USA could not win this conflict, could not defeat an enemy with a "non-traditional" approach to fighting the conflict, and this has proven pretty much true in each and every conflict the US has engaged in since. Apparently our country's civilian and military leaders are slow learners, but of course the 'Mercan public eats up the "shock & awe" rhetoric as if it were apple pie. A rational look at our foreign policy easily uncovers its fundamental flaw. Sadly, it looks as if the USA is getting ready to make the same mistake again. Smarten up people! This is what happens when you take a month long vacation from most of the world news; things seem so much worse when you get back, and maybe they are.